With Custom Dimensions, you can choose to track your own custom data and display it in your MonsterInsights dashboard and reports. You can track performance for authors, categories, tags, searches, users, and more. 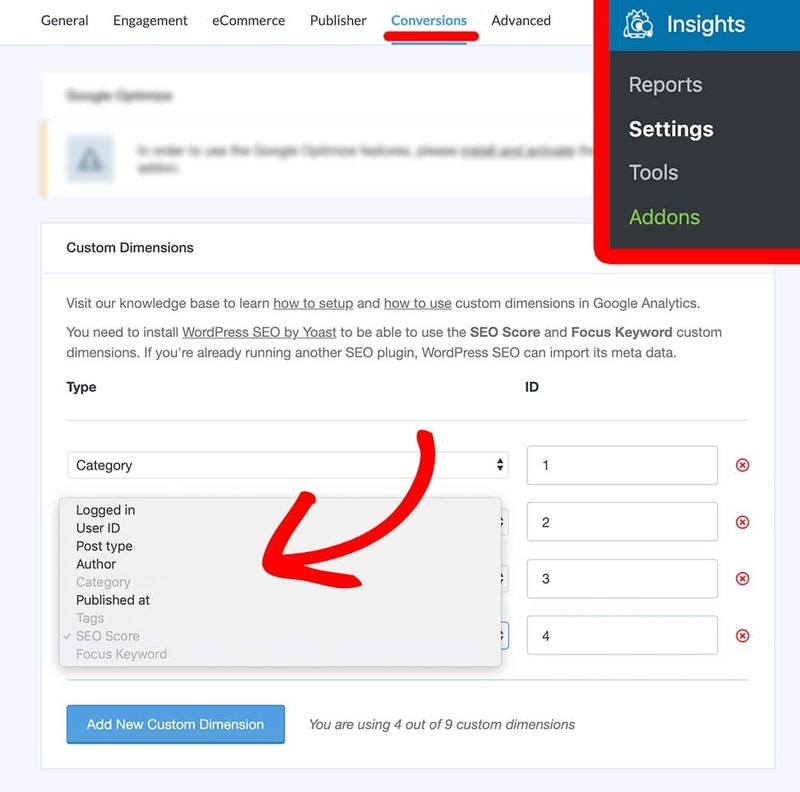 To be able to set up your own Custom Dimensions in WordPress, you’ll need the MonsterInsights Pro plugin and our Dimensions Addon (available to Pro level users and above). 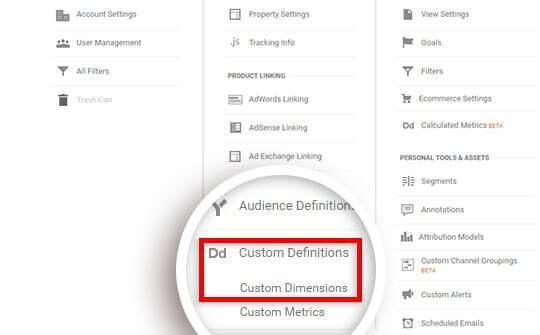 Custom Dimensions need to be set up both in MonsterInsights and in Google Analytics itself. In this article, we’ll guide you through the whole process step by step. First, you need to authenticate with Google Analytics. You’ll then want to enter your license key into MonsterInsights, if you haven’t done so already. Next you will want to install the Custom Dimensions addon. 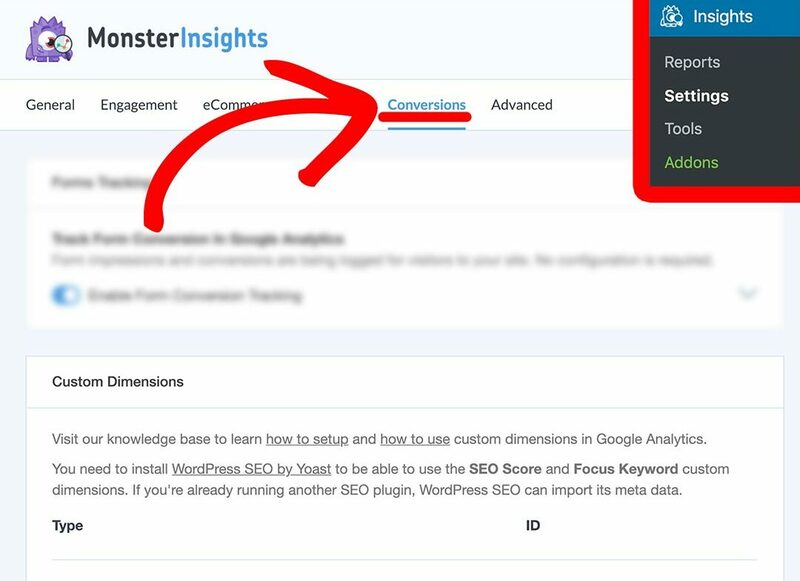 Now you can navigate to Insights » Settings» Conversions. Once there, scroll down to the Custom Dimensions area. Once on this page, click on Add new custom dimension. You can select the right dimension type from the dropdown menu. 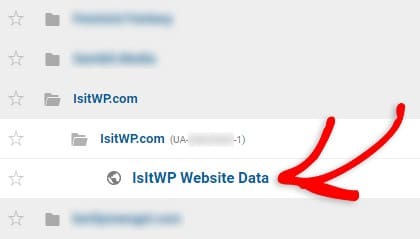 This custom dimension allows you to track whether your website visitors are logged in to your site or not. If you want to choose Logged In as the dimension type, choose Logged In from the dropdown menu. You can track each individual logged-in user’s activity by setting User ID as a custom dimension. This is ideal for eCommerce and membership sites. If you want to set User ID as the dimension type, choose User ID from the dropdown menu. If you have several custom post types in your WordPress site, you can track the performance of each post type with custom dimensions. If you want to set Post Type as the dimension type, choose Post Type from the dropdown menu. If you run a multi-author blog, you can identify what works best for each author. If you want to set Author as the dimension type, choose Author from the dropdown menu. Tracking the performance of different categories of your site is another great strategy to identify what works best. To set up category tracking, choose Category from the dropdown menu. You can track the performance of your posts based on when it was published on your site. If you want to set Published at as the dimension type, choose Published at from the dropdown menu. Tags give you more detailed insights about what specific topics work best on your site. To start tracking tags as a custom dimension, choose Tags from the dropdown menu. If you’re using the Yoast plugin for SEO, you can analyze the SEO score of your posts and pages in Google Analytics. If you want to set SEO Score as the dimension type, choose SEO Score from the dropdown menu. If you’re using the Yoast plugin for SEO, you can analyze the Focus Keywords of your posts and pages in Google Analytics. If you want to set Focus Keyword as the dimension type, choose Focus Keyword from the dropdown menu. Once you are done selecting, click the Save Changes button. Now that we’ve set up the Custom Dimensions correctly on your website, we’ll have to set them up in Google Analytics as well. To get started, you can go to Google Analytics, log in and Access Google Analytics. Now you can click on the Website Data link (or the name you gave your View). This will send you to the reporting part of Google Analytics. However, since we need to set up Custom Dimensions, you’ll have to click on the Admin tab in the left panel. 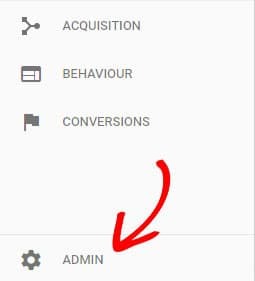 On the Admin page, click Custom Definitions and then Custom Dimensions. You’ll see a table where you can click + New Custom Dimension. Click that. Now you can fill in the name of your new Custom Dimension based on the dimension type you chose in Step 2. For example, if you chose Author as the dimension type, make sure to add the name as Author. After entering the dimension name, click Create. You don’t have to change any of the other settings. On the next screen, you can just click Done. Repeat the steps above for all custom dimensions you want to add to your website. 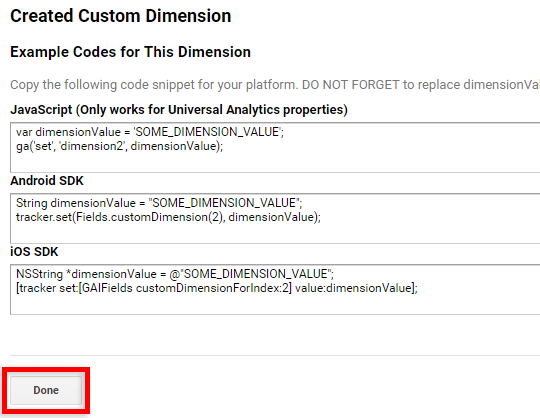 The final step is to check that the index number in Google Analytics corresponds with the Custom Dimension ID in the MonsterInsights settings. First, check the index number for your custom dimensions in Google Analytics. 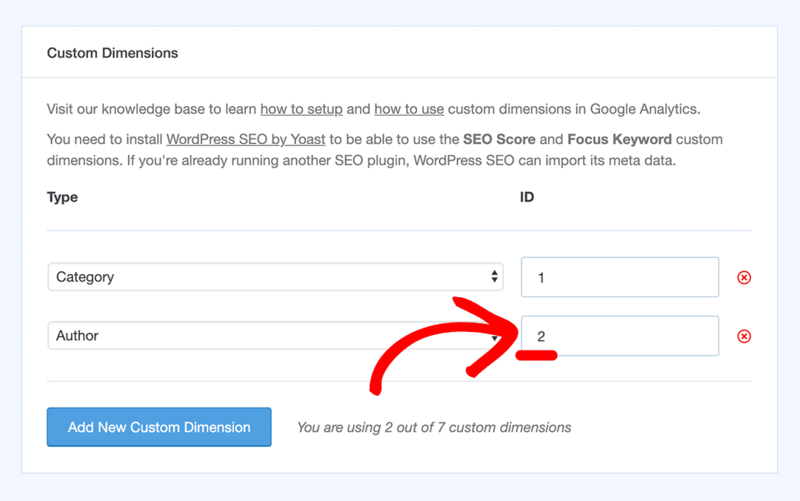 Next, go back to your Custom Dimensions settings in MonsterInsights. 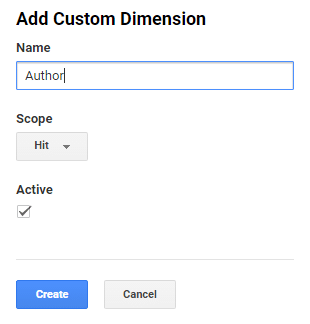 Make sure the Custom Dimension ID corresponds to the index number in Google Analytics. If not, type in the correct number and click Save Changes. Now you can go to Insights » Reports and click on the Dimensions tab to view your new custom dimension reports. If you enjoy having more and more data, you should definitely check out our Google Analytics eCommerce Tracking plugin. This will make it very easy for you to track your sales from your site!